Sweet in that canned-with-heavy-syrup way: kids will dig it, but it’s not exactly a delicacy. 100 min. Disney/Pixar. Director: Peter Sohn. Cast: Jeffrey Wright, Frances McDormand, Raymond Ochoa. How a film is publicized shouldn’t affect how the film is viewed, but then again we critical canaries sometimes sniff something in the coal mine. Like how Disney-Pixar’s The Good Dinosaur screened for local critics only about twenty hours before its opening (whereas Pixar’s earlier film this year, Inside Out, screened early and often). When a film will release in 3D, like The Good Dinosaur, it nearly always screens for critics in 3D, and yet this one didn’t. Now, I’m not complaining here, just…noticing. Now there’s little chance The Good Dinosaur won’t be a monster at the Thanksgiving box office, but perhaps the less-than-confident rollout relates to the film’s eighteen-month delay from its originally scheduled May 2014 release date (also irrelevant but…sniff, sniff). Alright, already, so what about the film? Is The Good Dinosaur any good? Well, this tale of a boy and his dog—rethought as a dinosaur and his boy—turns out to be a mixed bag, with some dazzlingly near-photo-real landscapes, sight gags that inspire waves of kiddie guffaws, and some impressive character animation sharing time with an overly familiar plot and character types. The film is sweet in that canned-with-heavy-syrup way: kids will dig it, but it’s not exactly a delicacy. That plot concerns what happens after a meteor misses the Earth 65 million years ago: the dinosaurs—including a young Apatosaurus named Arlo (Raymond Ochoa), his brother, sister, Momma (Frances McDormand) and Poppa (Jeffrey Wright)—continue to get by millions of years later. The runt of the litter, Arlo wants nothing more than to “make his mark” in the world and to make his Poppa proud. As per Bambi, that might not work out so well for Arlo, who finds himself separated from his whole family and pitted against a series of survival-of-the-fittest scenarios. Arlo’s situation owes something to the pesky intrusion of a feral human caveboy eventually dubbed “Spot” (Jack Bright). Swept away by the river, Arlo and Spot team up to make their way back home. The emotional beats here are pretty low-hanging fruit for an animated movie: overcoming smallness to grow up and prove worth, befriending an enemy, finding courage, and learning to say goodbye, E.T.-style. At its best, the story (credited to five writers, including screenwriter Meg LeFauve) evokes Jack London, but more often it feels like the proverbial camel—the horse designed by committee—with downright weird choices like a Western-themed midsection featuring Tyrannosaurus ranchers (most notably Sam Elliott) right out of City Slickers. The whole enterprise seems to have started from a place of “kids love dinosaurs” and not progressed much further than that. Yes, the amusing character dynamic between Arlo and the panting, lovably canine Spot works as it should, and director Peter Sohn does okay by the action while making room for left-field humor (like a brief hallucinogenic digression due to bad berries). But that title’s something of a head-scratcher in more ways than one…this Dino doesn’t soar. 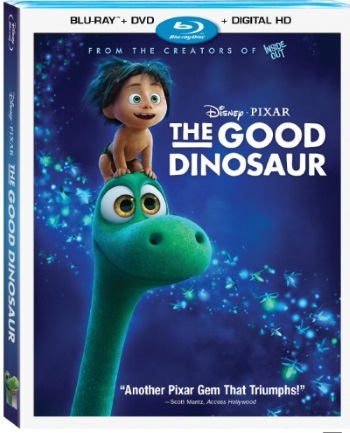 Disney's Blu-ray release of The Good Dinosaur (3D Blu-ray release is also on the market but not made available for review) offers stellar, reference-quality A/V. Aside from a touch of banding (common to animated transfers), the picture quality is perfect: bold in color and sharp in every detail and texture found in the source material. Deep black level and well-calibrated contrast further support the PQ, which is quite simply a feast for the eyes. The lossless DTS-HD Master Audio 7.1 mix doesn't miss a trick, either, in bringing home the substance of the theatrical presentation: it's a nicely immersive mix with discrete placement of effects and full-bodied music, neither threatening the clarity or priority of the dialogue. In bonus features, first up is an audio commentary with director Peter Sohn, story supervisor Kelsey Mann, animation supervisor Mike Venturini, director of photography (lighting) Sharon Calahan, and supervising technical director Sanjay Bakshi. Like most Pixar commentaries, this one'll be catnip for animation aficionados, akin to a master class in Pixar's overall approach to filmmaking in breaking story, designing characters, and realizing animation. Included here, as in the theatrical presentation, is Pixar's Oscar-nominated animated short "Sanjay's Super Team" (7:07, HD). "True Lies About Dinosaurs" (1:56, HD) sorts out fact from fiction as they pertain to dinosaurs—and humans. And then for something completely different: "Recyclosaurus" (6:19, HD) offers a look at how Pixar employees made dinosaurs out of donated goods. The brief featurette "The Filmmakers' Journey" (7:54, HD) gives a crash course in the making of the film. "Every Part of the Dinosaur" (6:08, HD) touches on the use of animation and specific choices within the art to build a character and thereby advance story and even themes. "Following the T-Rex Trail" (6:58, HD) finds the film's crew putting in research hours at a working cattle ranch to enable the Western-themed sequences in the film. Three "Deleted Scenes" come with an overall director "Introduction" (0:35, HD) as well as individual director introductions: "The Attack" (2:29, HD), "Building the Silo" (4:30, HD), and "Waiting for Poppa" (3:05, HD). "Dino Bites" (4:15, HD) amount to faux outtakes, with the characters hamming it up. "Hide and Seek" (0:59, HD) is a bit of Arlo and Spot playing the titular game. Lastly, Trailers include "Moment: North American Trailer 2" (2:25, HD), "Courage: Russian Trailer" (2:30, HD), and "Different: German Trailer" (2:03, HD). All site content © 2000-2019 Peter Canavese. Page generated at 04/23/2019 01:42:06AM.